iOS 11 has been released. I report focuses on the home screen and wallpaper changes. There are three kinds of influence. Changes affecting all users, affecting some models, affecting some wallpaper. 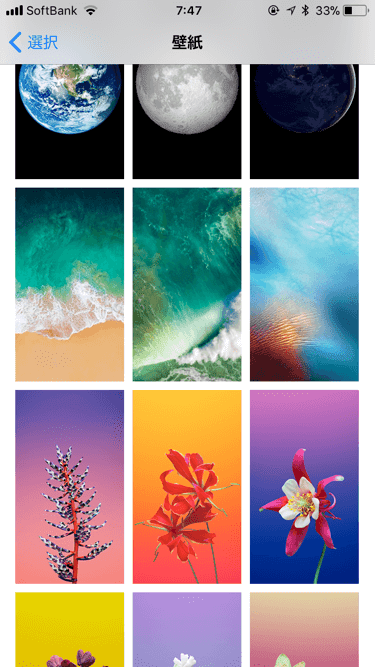 Check iOS Updates about Wallpaper for iOS 11.1 or later changes. On the iPhone, the Dock becomes lower, and on the iPad it is turned into a design floating in the space (the Dock of the iPad also has functional changes). The labels of the apps placed in the Dock are hidden. In the 5.5 inch and 4.7 inch screens, the dots indicating the number of pages above the Dock are also lowered. But somehow on the 4 inch screen, only the dots are left. The blur around the character which is included when the color of the background and text is close is weakened. Depending on the background characters are hard to see. Sep.21 postscript: The blur of the status bar is slightly stronger for some parts. Up to 14 characters are now displayed for the application's icon label, which was up to 10 characters in length. If it exceeds 14 characters, the end is "..." (in the case of a 4.7 or 4 inch iPhone). A new accessibility features that darkens only the background of the application without inverting content (Safari and other browser screens are totally reversed, maybe usability is not good?). In the home screen, there are bugs that invert some elements. The color of the icon also changes subtly. In Photos, it often crashes when setting wallpaper or moment of receiving AirDrop. Safari and other apps seem to crash as well. There are cases where only the app crushes or the iPhone restarts. A bug that Photos shut down when setting wallpaper a certain number of times has been fixed. Since the app icon easily goes out of the folder, it seems to be quite difficult to move the app in the folder. A lot of default wallpaper has been added for the first time in a while. There are also missing wallpapers. English fonts have not changed, but Japanese fonts are getting thicker, for example. This was misunderstood. Plus landscape up to iOS 10 did not correspond to square wallpaper. In the landscape, the center was only stretched, and only the part of the pre-installed wallpaper corresponded to the square. Finally, at iOS 11, if you use a square wallpaper, the landscape will remain the same size as the vertical screen. The specification catches up with the misunderstanding. This was also misunderstood for a long time. Certainly, up to iOS 7, the iPad corresponded to the square, and the wallpaper was well-balanced in both the vertical position and the horizontal position. But it got strange on iOS 7.1. In the vertical position, the lower side got to be cut off. In the horizontal position, the right side was cut off. The margins of the parallax effect also changed according to generation, and it was enlarged and displayed in the old iPad. From iOS 9.2 onwards, centering on the left and right, lower was cut off when the height was left over. The brightness were measured trimmed into a rectangle. It seems that it is finally restored on iOS 11 for the first time in 3 and a half years. Since the real machine is not in my hand, the margins of the parallax effect are unknown. On Plus iPhones, the distance between the icon and the icon label has changed. The distance between the icons was wider than the other screen sizes, but only the labels were cramped, but on iOS 11 it is expanded. Sep. 26 postscript: On the iPad, the brightness of the Dock, folders, background is extremely different. Results may vary depending on model. There are probably no such conditions that the Dock and the background are both bright. But there should be few wallpapers that will not get dark in this state. IOS 11 only measures the wallpaper size as size. You may not know what I am talking about. Since iOS 8, when the size of the wallpaper is smaller than prescribed, the Dock and folders pick up the surrounding color more. Furthermore, since iOS 8.3, if the size of the wallpaper is smaller than the prescribed, it is determined to be a dark wallpaper regardless of the actual brightness of the wallpaper. After that various bugs related to size accompanying it increased. However, iOS 11 does not respond like a dark wallpaper even if the wallpaper is small. The Dock does not unusually pick up color. It shows behavior as the color of the background. Do not measure the size. This means that all tricks with small sizes do not work. Although it did not make sense to link wallpaper size and brightness. For example, on the 4.7 inch and 5.5 inch iPhone, the width of 7 pixels or less cannot be set, 8 pixels in width can be set, 9 pixels is impossible...700 pixels is possible. There may be many thresholds. And the height does not seem to be related. 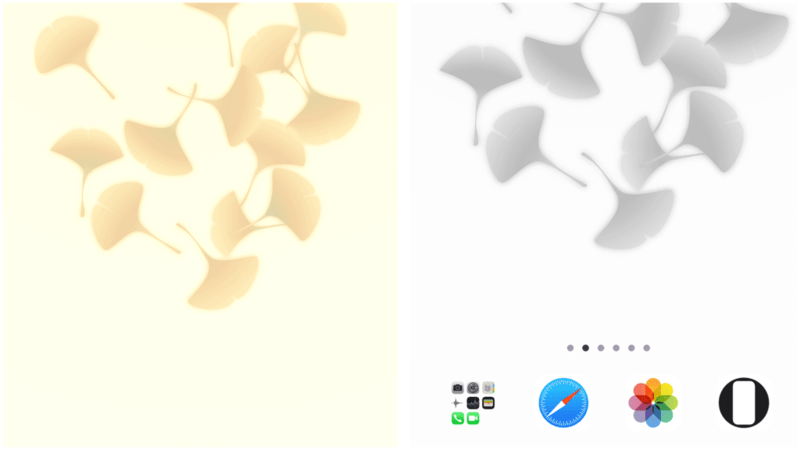 It also means that there are wallpapers that can be set if you rotate with Photos editing function. Just set it. If it is not settable size, the application or the iPhone will shut down. 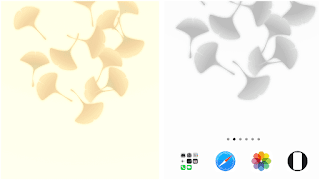 Sometimes a small gradation image is displayed step by step on the home screen. Depending on the color, it seems to be okay if it has some height. However, this only applies if the image format of the wallpaper is PNG. For wallpaper sites using general photos and illustrations, it is not often a problem because it is common to use the JPEG format that can increase the compression. It is not always. It differs considerably depending on the model. There is also no problem wallpaper. Although I do not understand the criterion well, it seems that monochromatization easily occurs with wallpapers with a low contrast a certain level (And wallpapers with irregular hue difference?). And somehow monochromatized wallpaper is displayed in color if the data original (without compression). However, small wallpaper may be monochrome because it degrades with save from Safari. This site has already responded. Anyway, some wallpapers will not work no longer due to these changes. Check "New wallpapers for iOS 11 and obsolete wallpapers" with the new wallpapers for iOS 11. I published a template that can confirm the square format of Plus iPhone. It shows the display set as Perspective. Popular size wallpaper has not changed since iOS 10.2. Since iOS 9.3 is slightly different, I organize the basic items. If the color of the wallpaper is dark as a whole, letters are white. If it is light overall, letters are black. Black letters are affected by the background, for example, if the wallpaper as a whole is reddish, it turns a little reddish black. When the wallpaper contrast (brightness, hue, saturation) is high, the background becomes dark. The upper part has a darker gradation shadow. There is no direct relationship between the color of the letters and whether it gets dark. Just as a trend, there are many white characters when it gets dark.